“So when are you hiking the AT?” This became the question hikers asked me and Xana, my wife and hiking partner. It seemed reasonable – we had hiked the Pacific Crest Trail already and even while we were in the thick of the Continental Divide Trail, it was assumed what would follow. But Xana and I marched lockstep in our heresy – we had no plans to hike the Appalachian Trail, maybe ever. And we didn’t give up our “Crowns” for legitimate reasons either; to raise a family or climb corporate ladders, we did it (gasp) to… hike… other… trails. “Hiker trash” just doesn’t have the same ring, does it? What long-distance hiker in their right mind would forego such an impressive honorific? Well, for one, hikers who are bound by the constraints of a reasonable work/ life balance and must be shrewd in choosing when and where to spend their remaining time on Earth, and also, those few who march to the beat of their own drummer. In 2012, I was shocked as our waitress at the North Cascades Lodge at Stehekin, delivered a half rack of ribs to Hollywood, a maverick from Portland, Oregon. Our flock of over a dozen PCT’ers eyed his meal with confusion and jealousy – we hadn’t seen that item on the menu. In fact, it wasn’t. Hollywood had the presence of mind to order off menu. I don’t know if Hollywood even remembers this moment, but for me, it became a metaphor for thru-hiking itself. Prior to 2012, the idea of foregoing a conventional life path for a four to six month adventure was simply an unknown option to us. Even in the midst of a thru-hike, we may struggle to explain our unusually ambitious (and indulgent?) adventures to the community at large who, for a host of reasons, don’t recognize thru-hiking as a viable life choice, particularly in a recession. It’s more widely assumed that a thru-hike will serve as the capstone on a hard-earned life path, awarded to oneself after having chased the proverbial carrot through a lifetime of work to reach a comfortable retirement. Of course, this gambit doesn’t always pay off. Many of my loved ones wound up in the pearly gates before they could enjoy their leisure years. Most simply weren’t of sound enough mind, body or finance, to pull off a thousand mile trek. So why did we choose the PNT for our third hike? Because the CDT left us wanting more of the same. More adventure-challenges that tested us to the core, more authentic West, more solitude, more in-your-face nature, more self-reliance and heart-pounding views. And as we eyed the PNT with its squiggly path across steep and jaggy mountains which guard our Northern border, home to grizzlies and wolves, mountain men and miners, we knew we had found what we were looking for. Forget Alaska, we wagered that there was still adventure to be had right here in the lower 48 on the Pacific Northwest Trail. And we were right! If you’ve ever wished you could use a time machine to hike the Pacific Crest Trail a few decades earlier, before every detail and need was solved by someone before you, then the PNT is the trail for you. It’s not about being in the first 300 to finish it. (Although that’s pretty darn cool, no?) It’s for those who want to hike without training wheels, to enjoy that wilderness experience they’ve walked thousands of miles to reach, but never quite felt, because the intrusion of development and our culture of convenience has, in its well-intended desire to help, actually deprived us the spoils of self-reliance. If you’ve ever wished you could squeeze a thru-hike into a summer vacation, then this trail is for you. The PNT may be a short trail, but its condensed, epic, mountain-to-sea route will leave you deeply satisfied in ways that other trails just can’t. Not for my money, anyway. 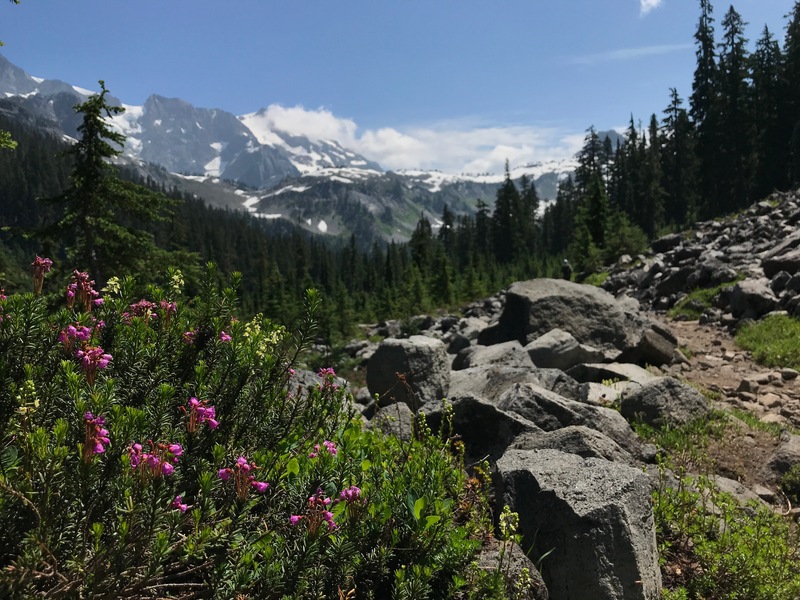 Even better, forget running down the trail chasing Old Man Winter, the Pacific Northwest Trail is short enough that you can afford to take your time. Slow boat it, if you like, in the spirit of the famous, 1976, 100 Days Trip through the Grand Canyon. Or, if you’re a PCT’er, think of Terrie Anderson’s belief that “whoever finishes last, wins,” because last place hikers gamble it all in a bid to soak up every last bit of pleasure and every humbling test that nature can offer. Now for those who are Triple Crowners and those still aspiring to be, put down those rocks. In 2015, I cheered on three close Triple Crowner friends and witnessed the awesome power of an ALDHA West awards ceremony to recognize the lifetime achievement of thru-hikers and trail angels by the only group that can properly do this — their peers. What I do question is when human behavior becomes so automatic that it blinds us to other options before us. I can’t tell you how many times I’ve met hikers suffering their way through a National Scenic Trail, which didn’t suit them, hating nearly every foot of it, only to earn a paper crown. This is the power of groupthink to blind us to the full spectrum of choices available to us. So why not embrace the atmosphere of freedom taught to us by our time in the wild and really, truly, hike your own hike. Hike because you love a range, because you’ve never heard an elk bugle, because you want to learn to be at ease with nothing between you and megafauna other than 50 denier ripstop. Do it for you, not the likes, and not a paper crown. My quick-witted hiking buddy of over 2,000 miles, Last on the Bus, was working on his Triple Crown, and doing it in the classic order: earning experience on the Appalachian Trail, then climbing higher on the Pacific Crest, where we met, and finally, testing the skills he’d honed in the master’s class that is the Continental Divide Trail. Somehow, as he neared the Northern terminus at Waterton Lake, the gravity of his achievement, and the other Triple Crown hopefuls I shared miles with, differed from mine. Their 7,847 mile journeys eclipsed the success of my 3,000 mile trek, which was untethered to a larger goal. Standing on the shores of Waterton, I felt deeply humbled and satisfied from that beast of a trail… and yes, I was a little jealous of them. Article contributed by Eric Wollborg, Communications Manager of the Pacific Northwest Trail Association and 2016 PNT thru-hiker. This article was originally submitted as a guest editorial in 2016. You can see photos from Eric’s Crown to Coast adventure on Instagram.